In 2008, 11 local village builders built the Tanop Community Education Centre (TCEC) in a village 47 kms south of the capital Phnom Penh. Today, as well as the Education Centre for school aged children, Singing Kites provides programs and support for preschoolers and university students. Today over 1,300 children from 32 villages attend the TCEC daily. They are part of rotating classes held from 8am to 7.30pm, five days a week. They come to study English, Khmer numeracy and literacy, mathematics, physics and chemistry, art, health education, traditional music and computer skills. 12 dedicated local teachers teach 43 classes a day totalling 215 teaching hours a week. We liaise with the local public schools seeing ourselves as an important supplementary support system for the children’s’ holistic education. Our role is to improve the children’s academic results and confidence, as sometimes conditions, poor teaching standards and the inability to pay fees, affect the learning opportunities of many rural children. Little ones from 3 to 6 years of age are able to access a head start in their education by joining our pre-school program in the mornings. We provide a safe place for them to take part in a fun program of free play, learning Khmer, English, art, singing, hygiene, and learning to be respectful and well mannered. We believe this is a wonderful way to start their academic journey. These pre-school children receive a free, nutritious breakfast from us each day. 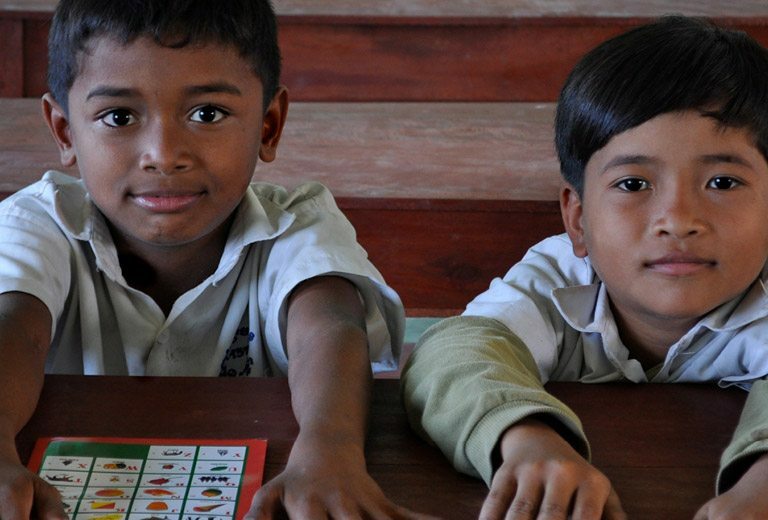 Education, more than any other factor, can provide hope, opportunities and job security to future generations of Cambodian children. Rural children are disadvantaged, as they very often don’t have the opportunities afforded to those who live in the cities. Cambodia needs leaders and those young people living in rural areas, need the opportunity to be empowered and have a voice. This will help a rural child from a disadvantaged background access tuition and attend school providing them with uniforms, a bike, and essential school supplies. We have realised that many of our children were coming to school without any food to eat. Focusing on the pre-school group, as they were at the most crucial growth stage, we employed a local village lady as our cook, and each day now, we supply up to 50 children with a nutritious breakfast.